Hello all! So I'm new to his forum and gun ownership in Chicago. It took 6 long months for me to finally own a sig P938 legally. Some of that was time was procrastination. 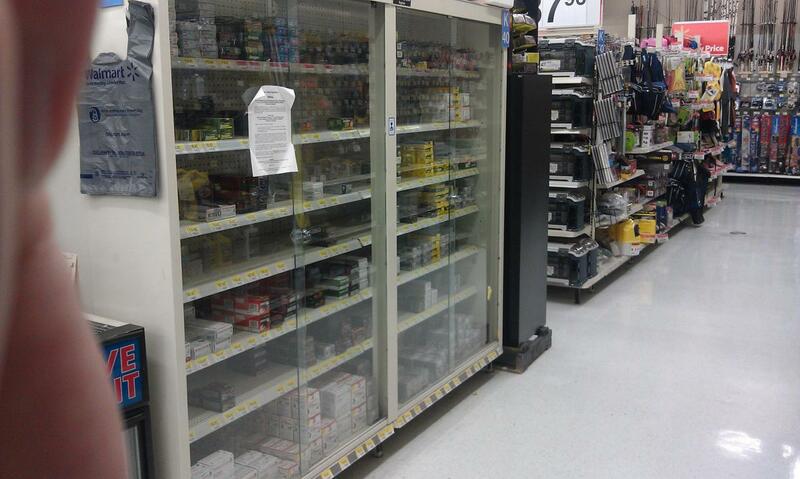 So I've been to few stores and everywhere is out of 9mm defensive ammo. All the online places seem to be few weeks behind in filling orders. Any of you guys know a chicagoland store that won't charge me an arm and leg for ammo and has it in stock? Edited by tom28, 31 December 2012 - 11:09 AM. Tom......welcome. I would recommend any of the larger stores/ranges outside of cook county. While I prefer to give my money to small businesses, I find it more difficult lately to find a decent selection in the suburbs nearest to cook county. You have to travel back into the past - to around August or September. 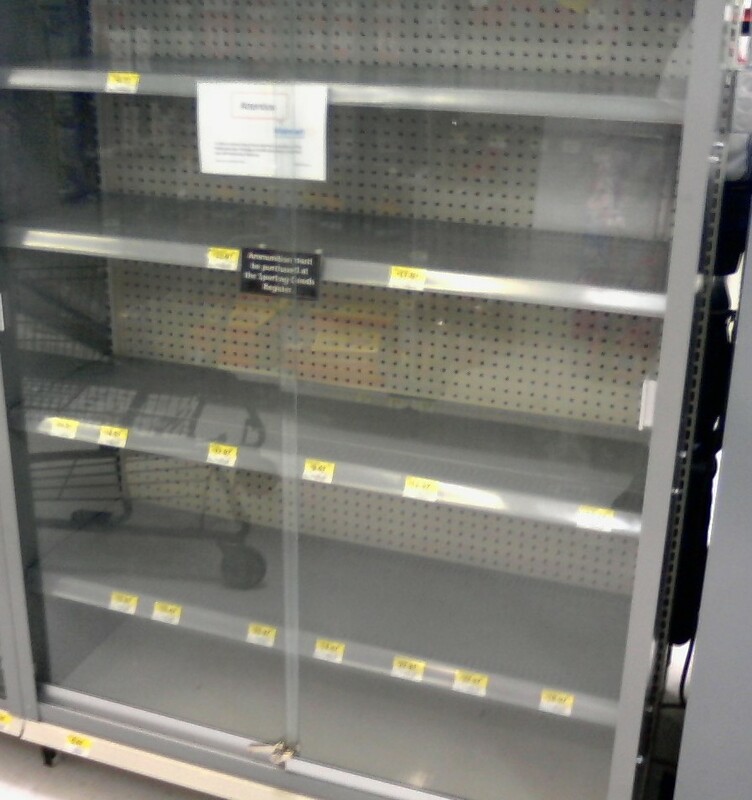 Walmart ammo shelf - going going gone! The walmart nearest to me has over 100 boxes of 223 in stock, as well as a decent selection of everything else. Yeah, I've been to Cabela's in Indiana and a few Walmarts. All 9mm defensive ammo was pretty much gone. There was some 115 grain but I'd rather use 124 grain for defensive use. I know of Midwest and Article II but they charge way to much for that stuff. Impossible! 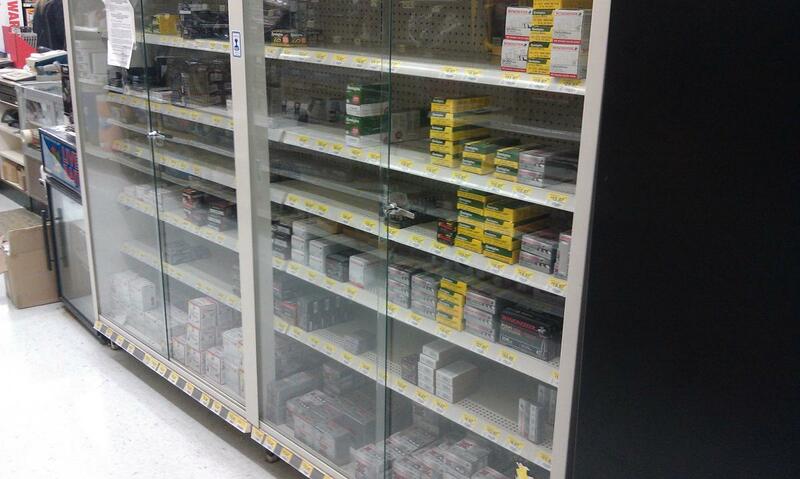 According to the Oswego Walmart manager, there is no market for guns in the area. There must be some dishonest shelve stockers. Its 2008/2009 all over again. I predict you will not see ammo until the summer, unless you work very hard at it. You'll eventually figure out a pattern, and take no prisoners when you do find ammo. You have to be there first, because as soon as someone else is there, they'll buy their limit, and tell their friends. At that point, you'll be contending with all the friends of store employees, and internet forum members throughout the state. Welcome to the site Tom. It was an ammo shortage that brought me here too - hopefully you'll stick around for the fight. Last time I was in R-Guns, they had cases of 9mm defensive loads available. Also in 357 and 40. I beleive it was Remington. 500 rounds. $380. Or, available at $19/box. The boxes were typical Remington green. Might have been "Sabre" but I don't recall. I did not take note of the weight. Sorry. I might have to make a day to drive around to find ammo. I was at article II and they were charging $24 for 9mm american eagle FMJ . didn't even bother asking how much JHP where. Tom28, I don't know how far you are willing to drive. Blanes Farm and Fleet in Woodstock usually carries some. Also try Marengo Guns in Marengo. Marengo Guns also has a web site, so you can order on line and pick up in the store a few days later. Good luck finding anything reasonably priced and in stock locally. I got lucky and found Federal HST 147 gr. for $249.99/500 rds on line....I bought them out!! Edited by billzfx4, 31 December 2012 - 12:15 PM. All three are within 10 minutes of each other. All three are very different in size, selection, and pricing. Thanks, definitely going to stick around. I loved hearing the courts decision that Illinois ban was unconstitutional. That's what made me decide to get a small single stack 9mm so I could carry around. I was going to get a springfield armory 1911 .45 for home defense. Now that I see .45 ammo around I kind of regret getting the sig. But it shoots like a dream, I just need to find AMMO! I saw a picture that someone posted yesterday of the Walmart ammo shelves that showed on .40 S&W and some .22LR, I couldn't find that one though. I have to admit that the picture I posted was of a Walmart shelf for 2009. I have a 1K of sellier and bellot 115gr 9mm on backorder at Sportsman Guide. I was able to join their membership club, get free shipping, two $10 coupons for future orders and the ammo for $214. Estimated shipping date is 03/13. Thanks for the suggestions guys. I'll report back when I have time later in the week to get out to those places. I'm in the heart of the city. 10 min drive from downtown. I'm will to drive out to find ammo though. I have such a pretty gun but no ammo to shoot it. I've already broken in the gun with 9mm fmj. I just need a few hundred round of defensive ammo so I know it'll feed reliably . Gander mountain and Mega Sports in plainfield had some 3 days ago but not cheap, regular price very limited selection. Mega Sports is pretty well stocked. I thought the prices were high until I just read that Article II is charging $24 for Federal 115gr! I think its about $16/box for that at Mega Sports. They had a package deal over the weekend with two 50rnd boxes of 124gr 9mm American Eagle Ammo with a box of 20rnd, 124gr Hydra Shock JHP for home defense for $52. I grabbed it to break in the new glock Santa got me! It's getting pretty slim pickings out there for ammo right now. In the last 2 days I've been everywhere in DuPage, Kane and McHenry Counties as well as Cabelas, and I can find NO .223/5.56 55 gr, 9mm 115 gr. or 30-06 150 gr for M! Garands which is what I buy except a few stray boxes here and there for very high prices. I've tried Walmarts and gun stores, hard to find anything right now. I can't even find 22 lr at either of my nearest walmarts, let alone .223 or 9mm. We finally got a snow and I wanted to do some coyote hunting, and can't find any damn ammo. Yrs ago I sold my 22-250 because ammo was expensive and scarce in my parts and switched to 223 because of availabilty. Now 22-250 is the only rifle round I can find LOL live and learn I guess. I was in Gander Mountain in Rockford on Sat. They had 350 rd. boxes of Blazer Brass 9mm FMJ for $99. Some self-defense loads on the shelf also. No AR's and no .223 except for three ammo cans of tracer for over $500 each. Thanks mike for taking you time to go out there. That seems to be the case at the walmarts I've been. 9mm picked clean. It's not a problem. I check their stock 2-3 times a week.